2018 was a super year for the Business Live radio show. 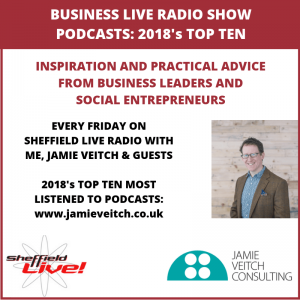 Over the course of 40 or so shows, broadcasting live on Friday mornings throughout the year, I got to pick the brains of a diverse range of business leaders, social entrepreneurs and self-employed creative folk. Guests generously shared their experiences, advice, ups and downs, top tips and formative moments. You can see details of all the shows in chronological order on the show page here or via the interviews category here. I very much appreciate the involvement of all my guests and all the comments from listeners. The show is broadcast live on FM radio and through Sheffield Live!’s internet livestream. It’s also available as a podcast afterwards and thanks to the magic of analytics I can tell you which Business Live show podcasts were listened to the most in 2018. Jon Seaton, CEO, Twinkl and David Battle, NEX Exchange. 28 April 2018. Adam Rose, Ofo Sheffield (sadly Ofo has now pulled out of Sheffield). 12 January 2018. Webmart’s “Marxist Capitalist” CEO Simon Biltcliffe (which was a November 2017 show). Madge Woollard, piano teacher and Steve Pipe on B1G1 and using your business as a force for good. 7 September 2018. Kate Welch OBE, founder and CEO of Social Enterprise Acumen CIC: resilience, sustainability and social enterprise success. 22 June 2018. Authors Joanne Harris and Ian MacMillan at Grimm and Co with Deborah Bullivant – this show was from 5 March 2016. Podcast and full details. GDPR without giving dodgy pros riches – Dr. Heather Anson. 2 May 2018. Jodie Marshall, MD and founder, A Mind Apart Theatre Company. 13 April 2018. Driving art to Monaco with construction plant hire boss Tom Hamilton, growing a Thai social enterprise with Heidi Fisher, social enterprise and social impact specialist, plus Mike Thompson of RiteTrax. 5 August 2018 – podcast and details. Kisha Bradley (Bright Box and #GirlswithDrills) and Darren Chouings (Sheffield Social Enterprise Network and The University of Sheffield). 4 February 2018. Thanks once again to every interviewee: I can’t think of a dull show because all of my guests have been so interesting and it’s a great privilege to present the programme. The show is aimed at anyone interested in launching, running and growing small and medium sized businesses and social enterprises. If you’d like to nominate a guest, do get in touch! And if you sign up to my email newsletter below you’ll get notifications about the content and guest of each week’s new show, plus other emails to help you communicate more effectively.